The $275 “Trust Me” omakase at Sushi Inoue in Harlem begins several dishes like this salmon noodle salad. Joel Grey introduced me to the Joy of Sushi at Take-Zushi in 1979. There have been many schools of sea creatures riding mountains of pressed-rice saddles in the years since. Now my sidekick in raw-fish ceremonies is Lauren, who was born somewhere in the second half of my professional tasting voyage. She is always game for an immersion in sushi. Even when the house is full Shinichi Inoue wants to do it all himself but tonight we're just seven at the counter. That’s how we come to meet up at Sushi Inoue on Malcolm X. Boulevard and 129th Street at 7:30 one evening this week. 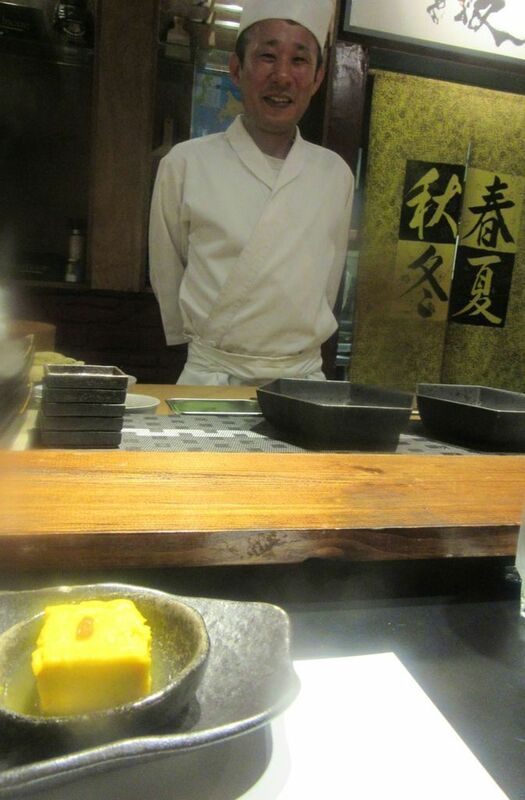 I slide onto the tall seat to her right at the counter and exchange nods with chef Shinichi Inoue. He looks a little like Pinocchio. I imagine him scoping us out. He has been catering exclusively to a rowdy group of five -- laughing and drinking -- at the other end of the counter. Otherwise, the sprawling room is empty. Finally it’s our turn and Chef Shiniche reaches out to deliver. 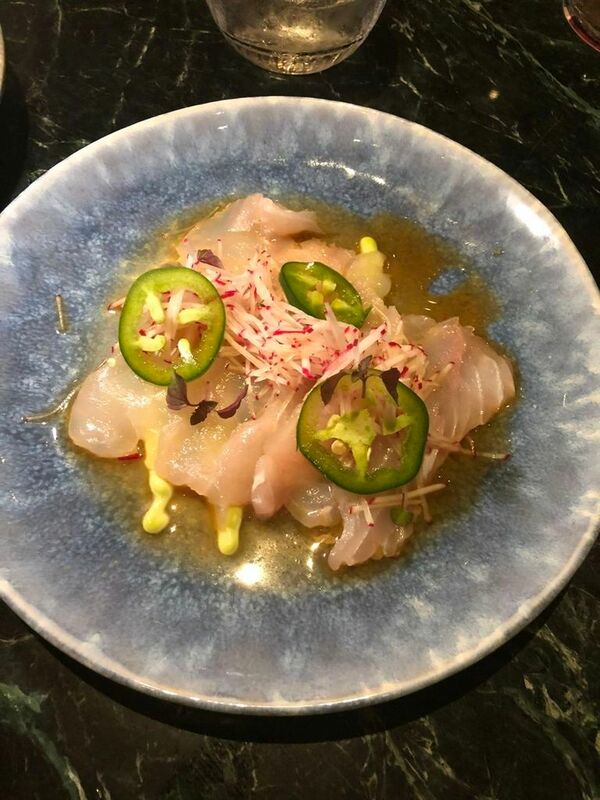 The house offers omakase -- “Trust Me,” the menu calls it -- at three levels, $175, $225 and $275 -- with or without an uni tasting, and all ending with miso soup, a hand roll and dessert. On my own, I would likely drift toward the $225 option, but I delegate Lauren to decide. I ask Lauren to pose with her tuna belly hand roll -- the finale before miso soup. I wish I had Lauren along in the days when I only bought clothes wholesale or from the reduced rack, or the last time I bought boots and had trouble breathing when I saw the price. She always encourages me to go for the premium. Tonight that’s the $275 tasting, plus a 20% service charge noted in small print that neither of us notices. 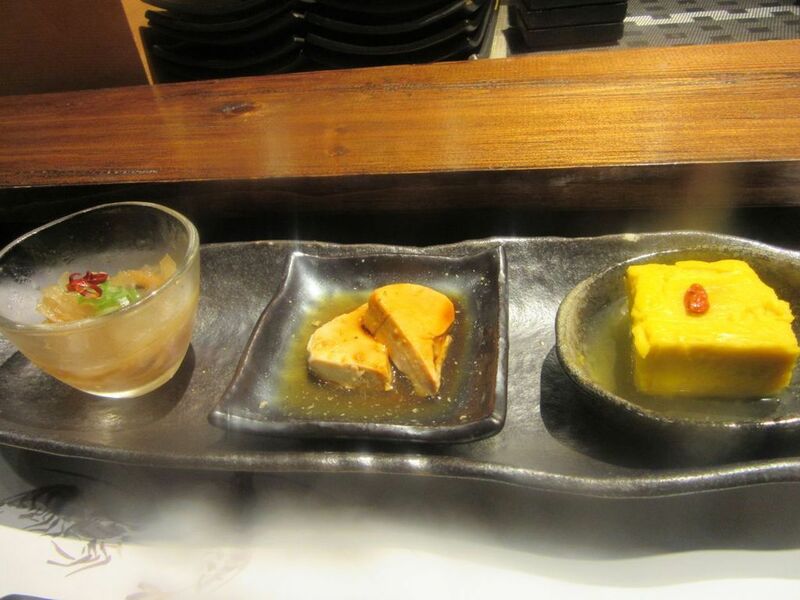 Now we’re starting with a trio of amuses, pickled fish, chunks of monkfish liver and pumpkin tofu. News of our commitment goes out, the chef nods and smiles, and after a ceremonial interval, each of us is contemplating a pretty trio of amuses: pickled fish, chunks of monkfish liver and a rectangle of pumpkin tofu. “Pumpkin,” Lauren notes. “Very seasonal.” The chef looks up from slivering and smiles. 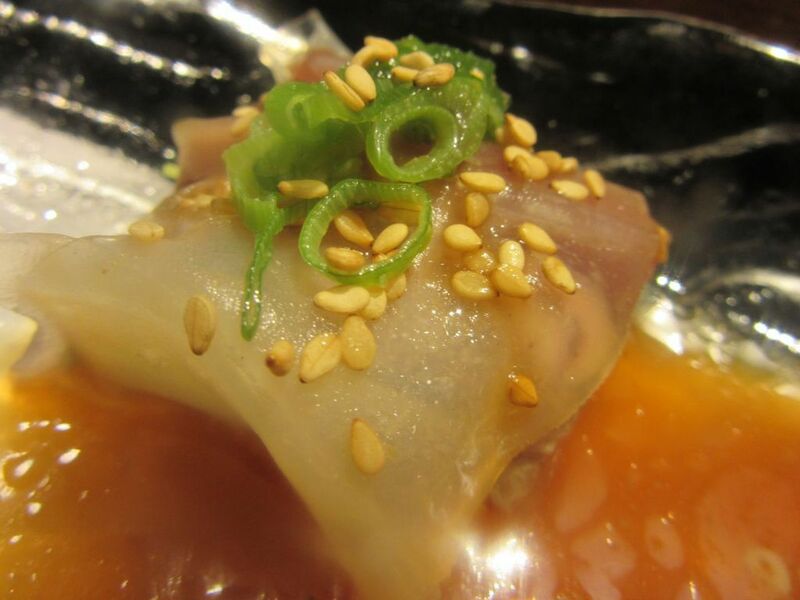 A large bonito spring roll topped with jalapeño rings and sesame seeds in a vinegared puddle is a big mouthful. Bonito spring rolls -- not just one but two for each of us -- topped with jalapeño rings and a drizzle of sesame in a tangy vinegared puddle are not easy to tackle in just one bite, especially if you have a tendency to choke a little on a pepper burn. The juice drips as I swallow the first one whole. It’s a complex and delicious and almost too much for a mouthful. 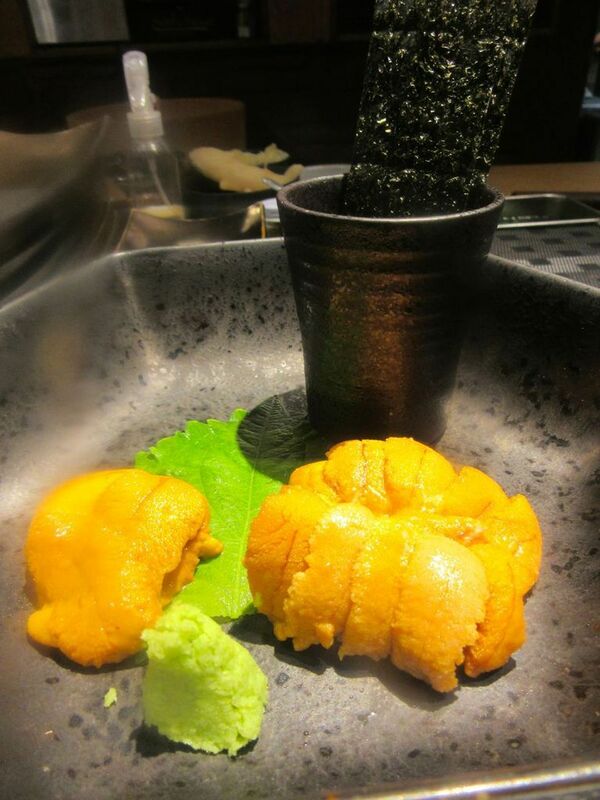 Here’s the uni tasting: Santa Barbara sea urchin on the left, Hokkaido on the right, strips of nori for rolling. A sake-steamed clam on seared egg custard in a toasted nori boat waits behind the prized uni tasting: the Santa Barbara sea urchin on the left, the Hokkaido on the right, “on the east side.” There are nori thins in a cup alongside to pile the uni on and roll for dipping. Inoue indicates his favorite uni sources on a map of Japan behind him. 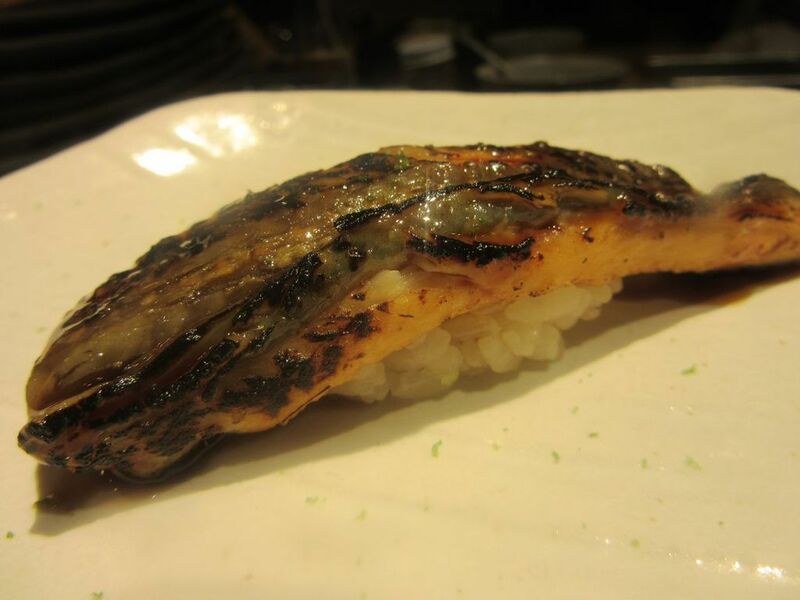 The chef forms two large nori boats to hold a deep catch of salmon roe. “My style is the downtown style,” he tells us. 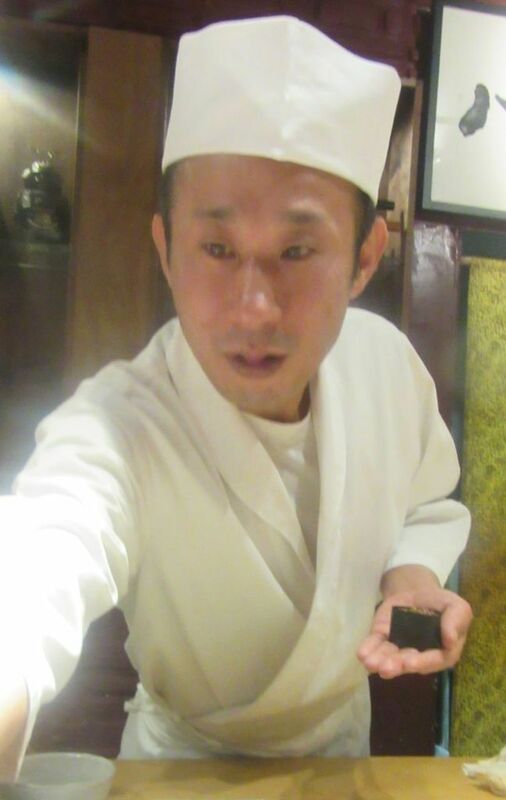 He worked for a long time in the Asakusa district of Tokyo where a feel of past decades survives, “not in the Ginza like Nakazawa, Onodera and Aname.” He makes his own blends of soy sauce -- a richer one for fatty fish and a lighter one for leaner kinds. 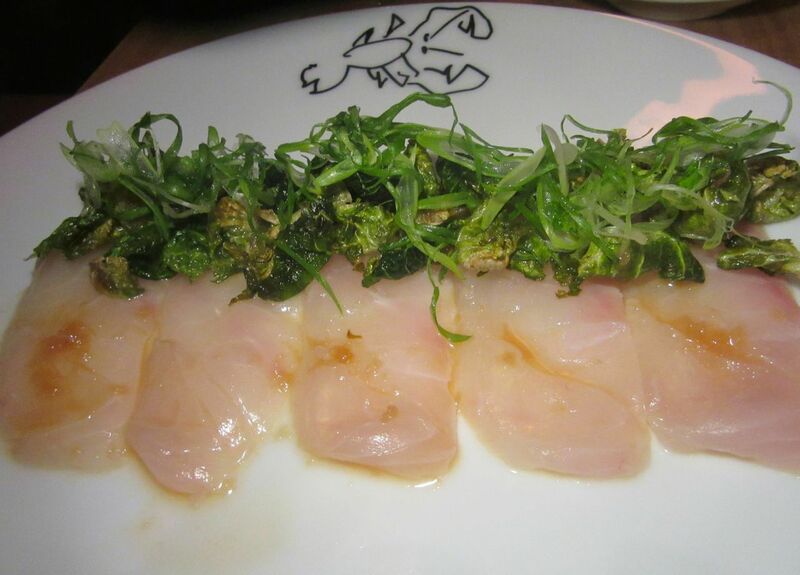 I’ve read that the chef blesses the fish that arrives from Japan before cutting it. Fried shitakes are stuffed with ginger with a pile of matcha salt alongside. A salad and a soba noodle dish with salmon, wood ear mushrooms, eggplant and shishitos follow. And then in a change of pace, fried shitakes with ginger and a pile of matcha salt delivered in a black metal basket. 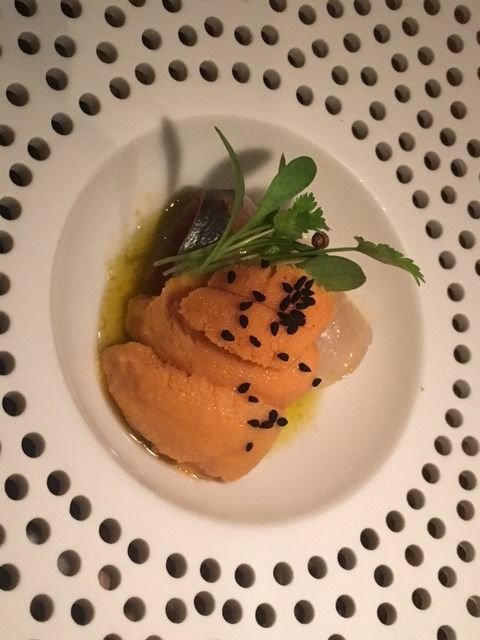 The premier omakase includes ten sushi. 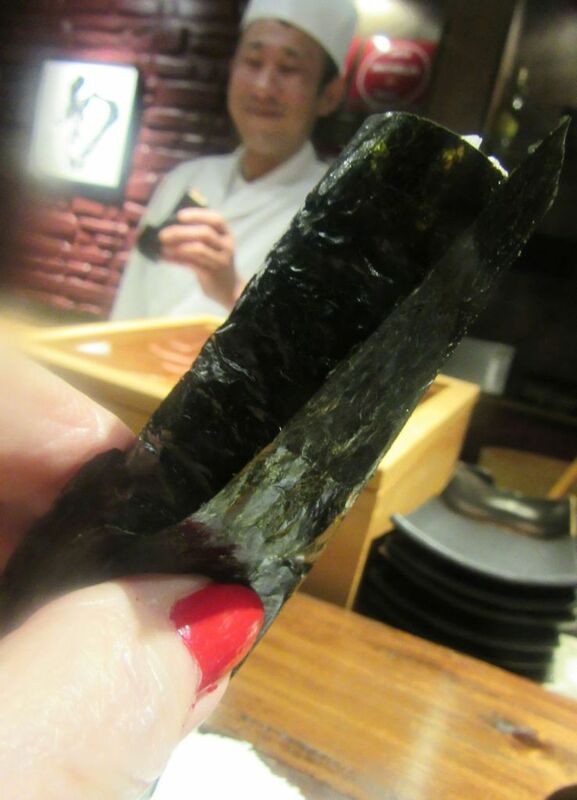 By the time the sushi parade begins, I’m already feeling full, but must taste it all, including this fluke. 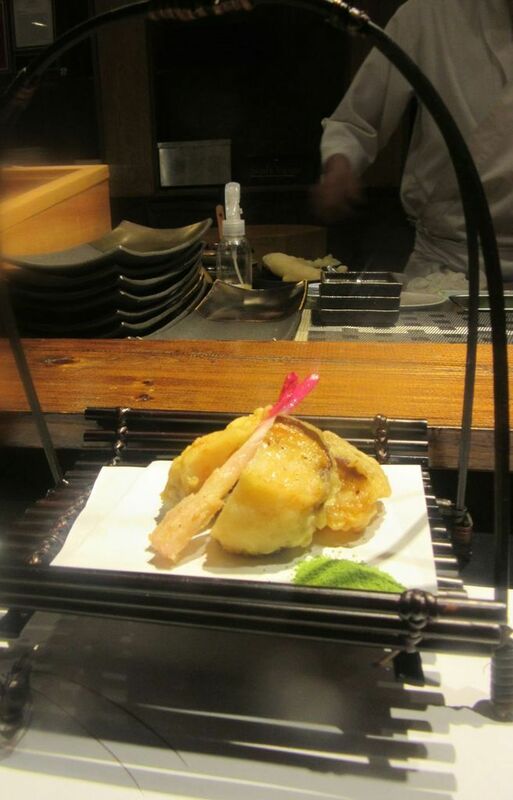 The chef caramelized the sea eel by toasting with his torch. 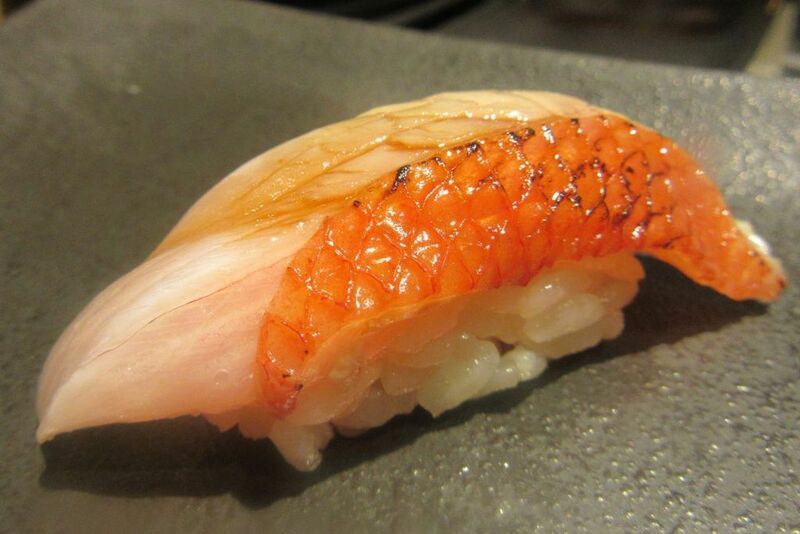 How beautiful can a simple cut of fish be. Then comes a parade of sushi: Horse mackerel, kampachi, fluke, sweet baby shrimp, marinated tuna zuke, otoro, a pile of uni in a nori boat, another of salmon roe, golden eye snapper from Chiba and sea eel. 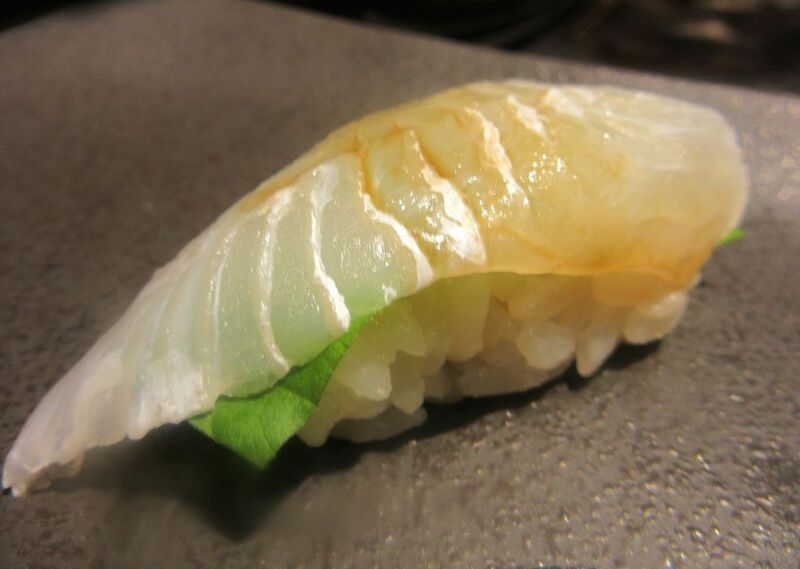 Some of these have artistic incisions or a unique garnish and all stretch out over a tiny cushion of rice. 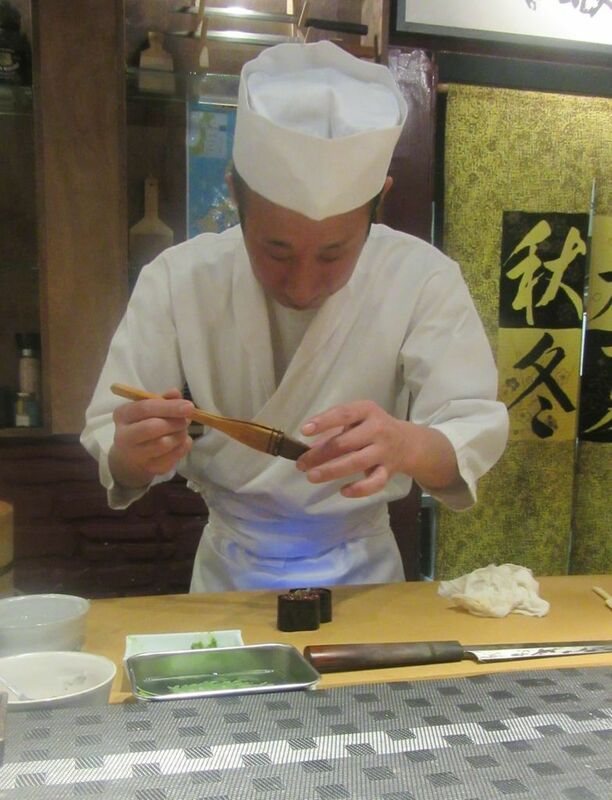 Occasionally the chef will stop to grate a flutter of wasabi on a specific fish. Even at this point, I’m already feeling too full. 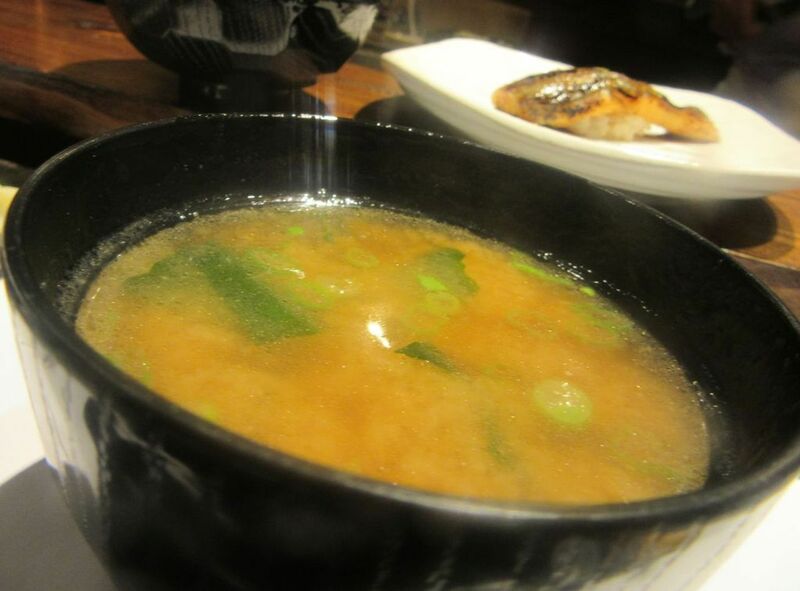 The miso soup is cery ordinary, easy to just taste a spoonful and focus on the sweet, moist tomago. 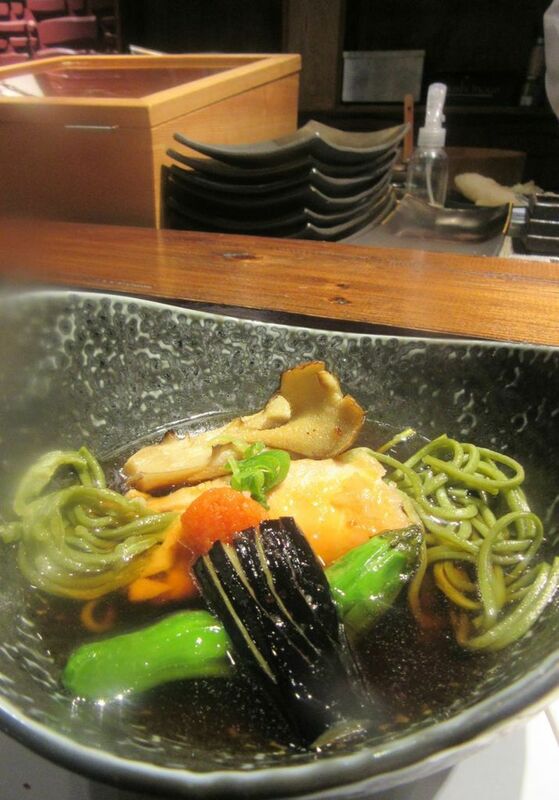 A bowl of very ordinary miso soup appears, along with the sushi finale: a richly caramelized sea eel. The house tomago -- a sweet little cake rather than the typical egg custard -- should definitely have come after the final hand roll, a tight little nori curl filled with tuna belly, one for each of us. I can’t finish mine. 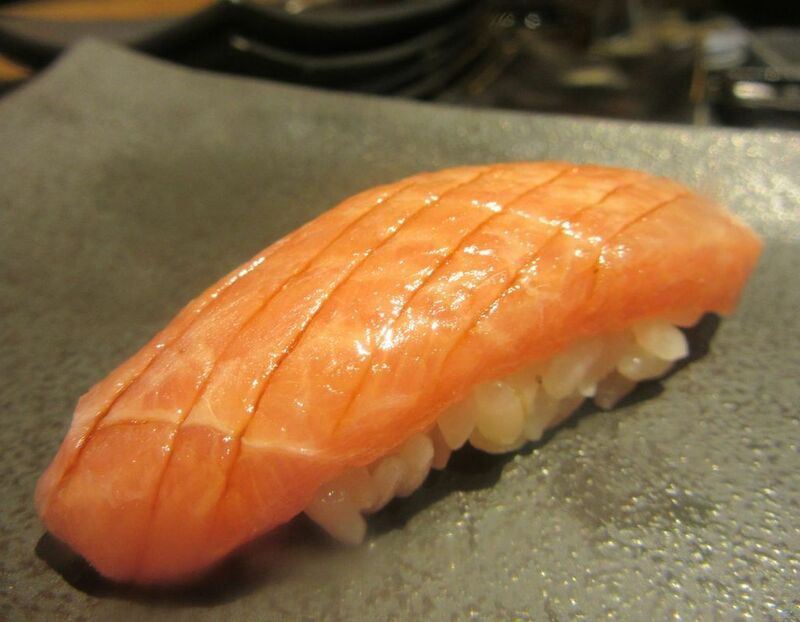 The tuna belly make roll would be better before the tomago. I can’t finish mine anyway. Dessert is an elegant and delicate grape panna cotta. I revive to taste, and survive to finish it. 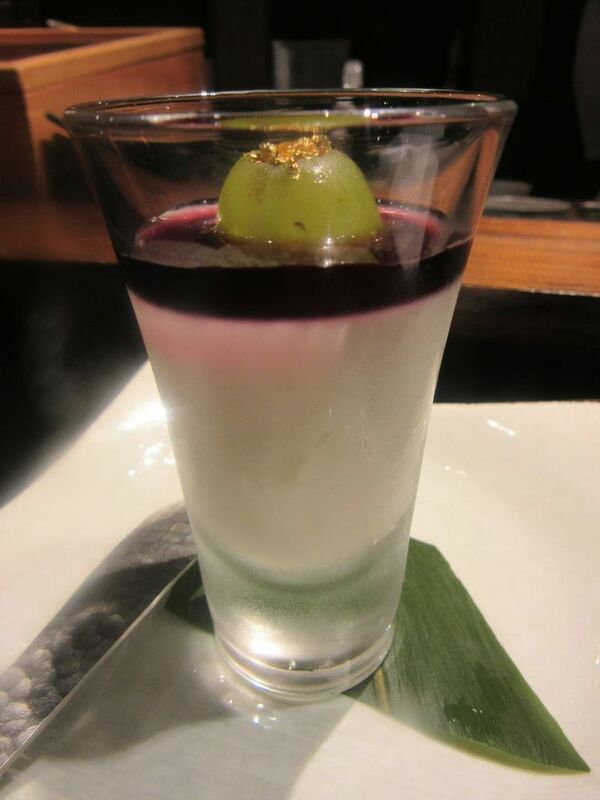 I revive to do justice to the elegance and sweetness of dessert -- grape panna cotta for autumn. Even though I’d committed to the $275 feast, it’s still a shock to see the $708 bill, I think with a giggle, signing off on the split, $354. I wonder how the evening’s excess will affect my dreams. 381 Lenox Avenue (Adam Clayton Powell Blvd.) on the NW corner of 129th Street. 646 766 0553. Tuesday through Saturday 5:30 pm to 11 pm. Sunday 5:30 pm to 10:30 pm. Closed Monday.